Back in September I wrote a post about the BIRT Image report item. 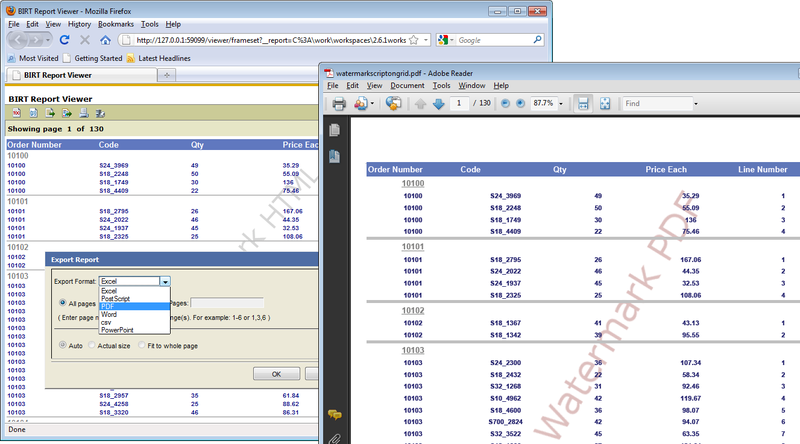 In that post I did not say much about creating background or watermarks for BIRT reports. In this post I will cover a few ways this can be accomplished. One of the simplest approaches is to just add your watermark/background image to the resource folder that you have configured in the designer. Note that you will also need to add the image to the resource folder of the deployed environment. Once you have the image in the resource folder, select the style icon in the outline view and create a new style. Set the background image for the new style to the image you added to the resource folder. 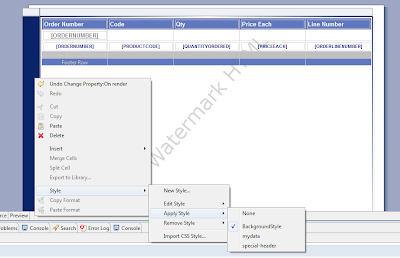 Next select the master page tab in the report editor and then right click on the canvas background and apply the new style. The watermark can also be made to be dynamic. 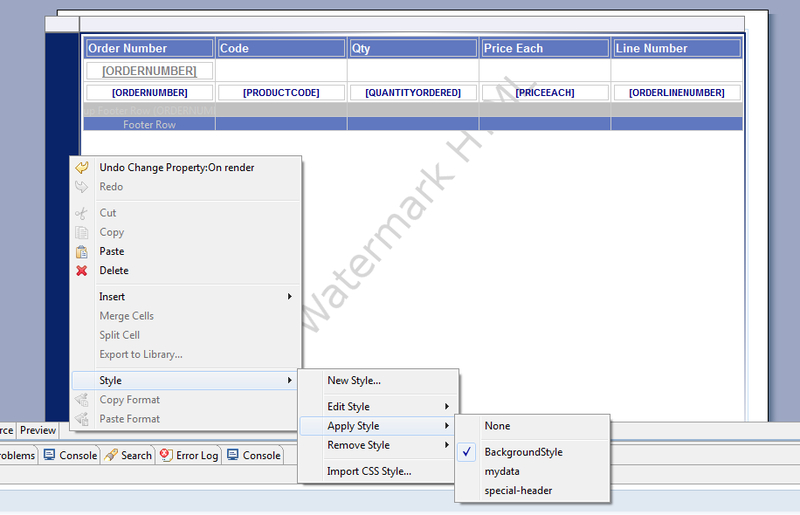 For example assume you want one watermark for pdf output and one for html. To do this you could add the second watermark to your resource folder and then use the following beforeFactory script to swap the image. There is one drawback when using this approach. Master page content is always created in the generation phase of the BIRT pipeline, which means if you use the BIRT Viewer and export the report to another format the above code will not work. This is because the frameset mapping in the Viewer generates an rptdocument that can be rendered in additional formats without the need to re-execute the report. If the report is not re-executed the master page background image cannot be changed. 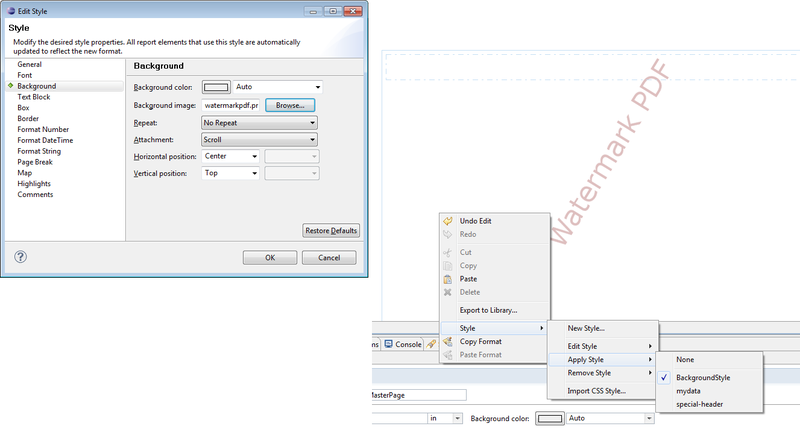 Another option which will facilitate exporting the report is to use a grid item instead of the master page for the watermark. 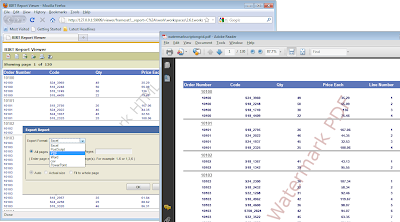 For example assume there is one table in the report design. You can add a grid to the report that has one column and one cell. Set the height for the grid to be the size of your page (eg 11 in). Drag the table into the cell. Select the grid row and apply your background style. Using the following onRender script of the grid row will allow you to change the style image at render time. The examples used in this post are available on Birt-Exchange.